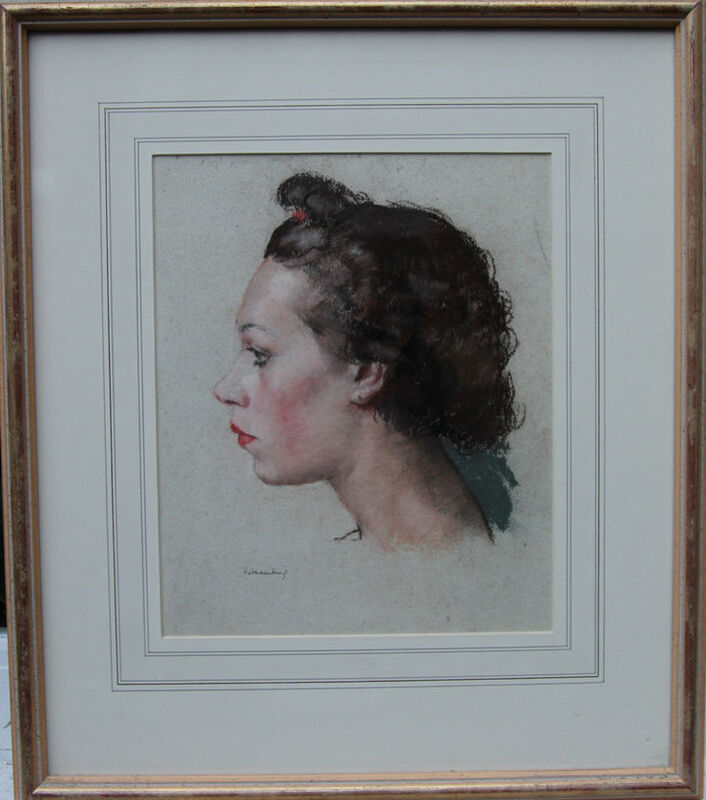 A fine detailed watercolour on paper by Royal Academician William Dring who was a noted portrait artist of the 20th century. 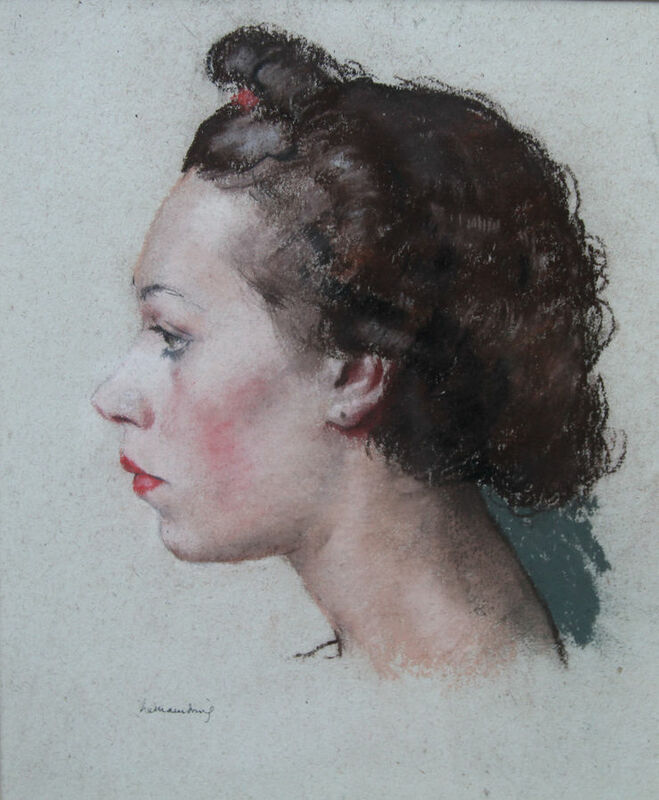 This portrait depicts a young woman in profile - and was painted circa 1937. A very evocative Art Deco portrait. In excellent condition and framed in gallery frame. A fine example of mid 20th century British portraiture. Signed lower left. Provenance. Abbot and Holder London. The Artist's daughter. Gallery frame 19 inches by 16 inches. Excellent condition. William Dring RA (1904-1990) - a painter, draughtsman and teacher, he was born Dennis William Dring, but was known colloquially as John. He was the brother of the artist James Dring, he married the painter Grace Elizabeth Rothwell, and their daughter Melissa was also an artist. Dring studied under Henry Tonks at the Slade School of Fine Art, 1922-25, and emerged as a fine draughtsman, a sympathetic portrait painter (fond of using his family as subjects), and a deft watercolourist. He won several prizes and scholarships at the Slade. He then taught until 1940 at Southampton School of Art, and became an official war artist. The Imperial War Museum owns 64 of his portraits in pastel (mainly of naval personnel who received battle awards) and five of his elaborately constructed oil paintings. He was elected an associate of the Royal Academy in 1944 when he showed a strong portrait of his daughter Melissa, and after the war he became a noted exhibitor at the Royal Academy, being elected RA in 1955. He produced a string of boardroom and official portraits, including the presentation of the Freedom of the City of London to the then HRH Princess Elizabeth in 1947. In 1981 he was commissioned to record the five most influential benchers of Lincoln’s Inn: Mrs Thatcher; Lord Denning; Mr Megarry; Lord Hailsham; and Lord Widgery.